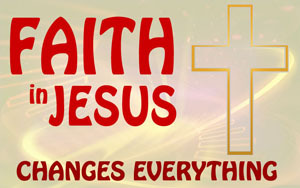 Sermons on Faith look at the topical of faith in Jesus Christ. Without faith it is impossible to please Him, for he who comes to God must believe that He is, and that He is a rewarder of those who diligently seek Him. "But without faith it is impossible to please Him, for he who comes to God must believe that He is, and that He is a rewarder of those who diligently seek Him" (NKJV Hebrews 11:6). "The time is fulfilled, and the kingdom of God is at hand. Repent, and beliee n the gospel" (NKJV Mark 1:15). How Do I Become A Christian? Faith! In the previous study, we explored the question: What is a Christian? We saw that Jesus required a person to repent and believe in the gospel. We concluded that genuine repentance consisted of a change of mind, a change of feelings, and a change of direction resulting in a change of lifestyle and conduct. This study we will examine the second part of Jesus' statement, which says that we must believe in the gospel. That is, "That Christ died for our sins according to the Scriptures, and that He was buried, and that He rose again the third day according to the Scriptures" (1 Cor 15:3-4). The Hebrew concept of faith conveys the ideas,"to believe" or "to trust" and the object of their trust was God and His Word (eg., Abraham is a clear example of this truth). The New Testament concept of faith also conveys the idea "to believe" or "to trust" and the object of trust is Christ and His Word (John 8:31). Faith is very important because faith is the means by which God enables a sinner to respond to His gift of salvation. Without faith we cannot please God. "But without faith it is impossible to please Him, for he who comes to God must believe that He is, and that He is a rewarder of those who diligently seek Him" (Hebrews 11:6). A. The Scriptures teach that God is the author of faith. Abraham's conversion is a clear example of the origin of faith. Abraham's conversion was initiated by God's sovereign call (Genesis 15:1-6). God called Abraham, but notice Abraham's response. He responded by believing, thus God credited his belief as righteousness. God's call stresses His sovereignty in initiating act of Abraham's salvation, and it was followed by Abraham's response. Man's responsibility is to respond. We can conclude from Abraham's conversion that God is the one who calls and man is the one who responds. B. The New Testament continues to teach that God is the author of faith. Romans 3:10 makes it absolutely clear that man is totally lost without God’s intervention. Jesus confirms this process. Jesus said, "Truly, truly, I say to you, he who believes has eternal life" (John 6:47). But in the same context, Jesus also said, "No-one comes to Me, unless the Father who sent Me draws him" (John 6:44). God draws the sinner to Christ and gives him the ability to believe. When Apostle Peter affirmed his faith in Christ as the Son of God, Jesus told him, "Blessed are you, Simon Barjona, because flesh and blood did not reveal this to you, but thy Father in heaven" (Matthew 16:17). This is why the Apostle Paul could say, "For by grace you have been saved through faith, and that not of yourselves, it is a gift of God" (Ephesians 2:8-9). It is so important to realise that God is the One who calls and man is the one who responds. The reason this is so important is because we must respond to God on His terms. Remember God is sovereign. Therfore, God accepts us on the basis of our respond to His call. A. What faith is not! Faith is not a blind leap in the dark. Faith is not accepting something without any understanding (Matthew 13:19-23). Faith is not simply an intellectual assent to a set of historical facts or spiritual principles. James made this quite clear (James 2:14). Faith is not an ambiguous understanding of belief (James 2:19; Matthew 13:23). Not all faith is saving faith. Faith is understanding the truth of God's Word and the aspects of forgiveness through Jesus Christ. Faith is deep conviction of the truth and the reality of what Jesus has done for the sinner. Faith is a personal trust in the Lord Jesus Christ. A personal trust in Jesus Christ means complete surrender. A personal trust in Jesus Christ means a commitment to obey Him. The unsaved man cannot respond to God in obedience. The unsaved man cannot trust God for he does not know God. True saving faith leads to obedience. Faith is inseparable from obedience. Believe is synonymous with obey. John 3:36, "He who believes in the Son has eternal life; but he who does not obey the Son shall not see life." Acts 6:7, "a great many...were becoming obedient to the faith." Obedience is an integral part of true faith. Hebrews 5:9 again reflects this truth, "Having been made perfect, He became to all those who obey Him the source of eternal salvation." This is why the apostle Paul said to the Corinthians, "Examine yourselves as to whether you are in the faith..." (2 Cor. 13:5). What does Paul mean by examine? Does your life demonstrate obedience to the will of God? Is Christ first place in your life? Have you counted the cost? True saving faith is continuous (Gk. verb "believe" is used in the present tense; therefore, not a one time act). True faith is marked by endurance (2 Tim 2:12). Paul's words to Timothy emphasise this reality, "If we endure, we shall also reign with Him, if we deny Him, He will also deny us" (2 Tim 2:12). Remember: Only through faith can we respond to God. Faith is not a blind leap in the dark. Faith is a belief in the facts of Jesus Christ as learned in the Bible. This sermon on faith is part of a series of sermons that I put together to explain the foundations to Christianity. You can check out the rest of the sermons by clicking on Christian Foundations.